On August 7-9, 2015 Americans from all over the country will meet in West Yellowstone, Montana to discuss, strategize and unite in building a coalition to address the need to reform wildlife management in America. It’s time for wildlife management to integrate the science of the 21st century and the ever-changing demographics and values of our citizenry. The status quo of wildlife management in America is broken and it needs to be fixed. 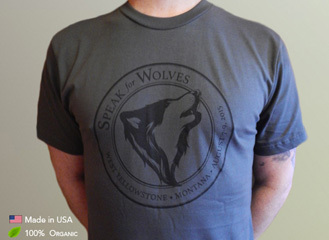 To be notified of the Speak for Wolves 2015 updates – please subscribe here. 7:00pm Screening of OR-7 the Journey with filmmaker Clemens Schenk. Amaroq Weiss of the Center for Biological Diversity will be part of the Q&A session following the film. Tickets cost $10 and can be bought online athttp://www.brownpapertickets.com/event/1634194. They can also be purchased at the door-cash only. 12:30pm Kim Wheeler, Executive Director of the Red Wolf Coalition, will discuss the plight of red wolves and the USFWS Red Wolf Recovery Program. 2:00pm activist Oliver Starr will discuss the reasons for the sharp decline in gray wolf populations in Denali National Park in Alaska and offer remedies. 3:00pm Brian Ertz, founder and Board President of Wildlands Defense, will discuss the failure of the controversial McKittrick Policy and why it needs to be reformed. 6:30pm doors open with live music by Matt Stone. 7:00pm Camilla Fox, founder and Executive Director of Project Coyote, will discuss current efforts to end wildlife killing contests on public and private lands. A panel discussion will follow with Amaroq Weiss, West Coast Wolf Organizer of the Center for Biological Diversity, Kevin Bixby, founder and Executive Director of the Southwest Environmental Center, and author/ecologist George Wuerthner. The entire program on Saturday is free. 9:00am doors open with music by Goodshield Aguilar. 9:30am Mike Mease, co-founder and Board President of Buffalo Field Campaign, will discuss the continued hazing and slaughter of wild buffalo in/around Yellowstone National Park and efforts to list the species under the Endangered Species Act. 10:30am Louisa Willcox, wildlife advocate and long-time conservationist, will discuss the government’s ill-conceived push to remove federal protections for grizzly bears and examine the role that states play in wildlife management. 11:15am Interpretive dance by choreographer MaryLee Sanders. 11:30am Inspirational talk by Jimmy St. Goddard of Blackfeet Nation. The entire program on Sunday is free. Rachel Tilseth is the founder of Wolves of Douglas County Wisconsin, a wolf advocacy site, first started in the summer of 2012 for the purpose of getting dogs out of the wolf hunt. Rachel Tilseth has been involved with WI’s Wolf Recovery Program in one way or another since 1991. Tilseth was a Volunteer WDNR Winter/Wolf tracker from 2000-2013. Rachel is an artist, blogger and educator living in the heart of wolf country in northern Wisconsin. 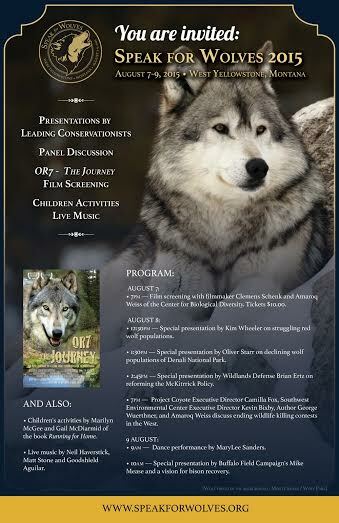 Speak For Wolves 2015 – Come Join Us! These cowboys, who all happen to be women, are just one of the ways J Bar L is trying to manage its grass-fed beef operation to benefit livestock, people, wildlife, and habitat. To figure out how best to do that, the ranch works with numerous partners, including NRDC (disclosure), the Nature Conservancy, and the Sage Grouse Initiative. Scientists are studying, for instance, whether structures that mimic beaver dams, installed to rehabilitate stream channels, may benefit Arctic grayling, a rare native fish that sports flamboyant, turquoise-spotted dorsal fins. And on two greater sage grouse leks, biologists are investigating what factors enable populations of these iconic—and possibly soon-to-be-endangered—birds to nest successfully. That’s why she was out early that May morning, scouting for predator activity in the days before thousands of cattle would arrive for the summer. Grizzlies, of which five or six roam the valley, killed one calf last summer, as well as an adult cow—no small feat considering the bear likely weighed half as much as the 1,400 pound ungulate. This time, Zaranek saw evidence of wolves. “I found a really great hot spot,” she says while we sit at her kitchen table the day after the recon mission. “There were tons of tracks.” She says it looks like there may be three packs carving out territory in the valley this year, up from two in 2014. Last year, Wyoming, Idaho, and Montana were home to an estimated 1,657 wolves in 263 packs with a total of 75 breeding pairs, according to the Northern Rocky Mountain Wolf Recovery Program. The canids were confirmed as the killers of 140 cattle, 172 sheep, 4 dogs, a horse, and a donkey. Private and state agencies shelled out almost $275,000 in compensation for wolves damaging livestock. Wolves died, too, of course—ranchers and wildlife managers culled 161 of them for coming into conflict with livestock or other wildlife. “Even last year, when we had cattle right by an active wolf den, we didn’t lose any,” says Ulring. “Cattle or wolves.” They used electric fencing to keep the herd tight and the wolves outside the perimeter. “This is not just about dead animals,” says Ulring. “A stressed animal has minimal weight gain or can even lose weight. Our animals, even when they were near that den, they’re gaining more than three pounds a day.” All that extra poundage translates into dollars, allowing the ranch to sell more steaks and burgers. Researcher Azzurra Valerio of the Large Carnivore Conservation Lab at Washington State University says she isn’t surprised to hear of the program’s success. Ranchers taking similar steps elsewhere in the West report fewer losses, too: the Blackfoot Challenge, in northwestern Montana, for instance, has seen a 93 percent drop in grizzly bear conflicts since it started using range riders and other deterrents in 2003. But Valerio cautions that although there are a lot of stories and anecdotes of livestock and predator harmony, “to my knowledge, there are no evaluations of the efficacy of nonlethal methods such as range riders or fences.” She hopes to change that. Centuries ago wolves roamed the wilds of Ireland. In this full-length feature Ireland’s Wildlife contributor Dan Lettice, explores whether or not, one day, they could do so again…. The grey wolf, Canis lupis, was once reasonably common in Ireland and existed on all parts of the Island. The last wolf in Ireland was probably killed in or around 1786 but small populations or individual wolves may have existed into the early 1800’s. Before English rule in the country wolves were hunted, mainly by the ruling classes, and plenty of wolf skins were exported to Britain, but there seems to have been no coordinated attempt to exterminate them. During English rule this changed, and people began to view wolves as a troublesome species and targeted them for extermination. During Cromwell’s rule bounties for wolves were initiated and so began the complete removal of the wolf from the Irish landscape. The wolf itself was once one of the most common land based mammals on the planet, and existed in the whole of the Northern hemisphere and on the Indian subcontinent. Sub species also existed in parts of Africa and South America. As human populations across Europe grew the wolf population suffered. There were many reasons for this, loss of habitat and decline of prey certainly contributed but a building hatred toward the species, mostly based on myth and folklore, resulted in their removal from large parts of Western Europe, with only isolated populations remaining. As European Settlers set sail for the New World, North American Wolves suffered the same fate. As the settlers moved west across what is now the United States, wolves were steadily hated into extinction in most of the lower 48 States. No other animal suffered the same level of hatred and concentrated effort to exterminate it. The almost complete destruction of the North American bison herd and the introduction of domestic cattle compounded the hatred and intensified the extermination effort, as wolves increasingly came into conflict with humans. For a much of the latter 1800’s and early 1900’s a large proportion of this extermination was state-sponsored. Finally in the early part of the 20th century most of North America’s wolves had been exterminated. An animal that was once revered and highly respected by Native Americans suffered the same fate as it had in Europe. Although populations remained healthy in Canada, Alaska, Russia, and parts of Asia, the grey wolf had been removed from almost everywhere it found itself in proximity to people. Fast forward nearly a century to 2015, and talk of re-introducing wolves to Ireland. I’ve heard plenty of people arguing for re-introduction, or supporting it, but there are many complex issues that need to be considered before a re-introduction could even be considered. Many people consider wolves the epitome of true wilderness. Perhaps a pang of guilt for our role in their destruction makes some of us desperately want them back in our landscape. I would love, in an ideal world, to have wild wolves roam Ireland again, and I’m not alone, but not at any cost. The re-introduction of a top predator, what was perhaps Ireland’s top predator, into an area would have many benefits. Predators affect not just prey species, but the entire balance of an ecosystem right the way down the food chain. This natural phenomenon, known as trophic cascade, impacts everything from the immediate prey species right down to the primary producers in the ecosystem. When wolves were re-introduced to Yellowstone National Park in 1995, for example, elk, which form a large portion of the wolves’ diet in the park, could no longer stay in a feeding area for long periods overgrazing local plant populations. Instead, with wolves to worry about, elk, white tailed deer and mule deer had to be wary, and stay on the move to evade the predators. We observed this at a distance on a recent visit to Yellowstone. On a faraway hillside a large, strung-out group of elk were feeding in reasonably close proximity to the Junction Butte Wolf pack. Over the course of 5 hours the elk fed on surrounding vegetation, but they were constantly moving and watching the wolves. The wolves kept them ‘honest’ by attempting to take an elk on a few occasions. In the absence of wolves the elk would have continued to overgraze the plant population. Twenty years after the re-introduction of wolves the trophic cascade effects in Yellowstone are clear. Once over-grazed willows, aspen and other small trees are now thriving. Beavers have re-populated the park to take advantage of this ready supply of food and building material for their dams. Waterfowl, bird, and fish species have moved in to take advantage of the habitats created by the beavers, and so it continues. From an Irish perspective a re-introduction might result in less tree damage from deer herds which have become over abundant. These deer are the subject of annual culls to control their numbers. In theory, a wolf re-introduction might result in these deer becoming more vigilant, resulting in less damage to our forests in the areas selected. Whether wolves would result in a significant reduction in deer populations is another question. Wolves generally kill weak, sick, young or old deer, and any re-introduction here would likely involve a small, heavily controlled wolf population. In such a scenario a significant reduction of the deer population would be unlikely. Another potential benefit of wolf re-introduction is a possible eco-tourism opportunity. Wolf watching, similar to what already exists in Yellowstone, Northern Spain and parts of Scandinavia could potentially contribute significantly to the local economy of re-introduction areas. It may also, selfishly, satisfy our desire to see wolves roam in Ireland once more, bringing a little ‘wild’ back to an Island that in reality has lost most, if not all of its true wilderness. Those that argue against a re-introduction on the basis of the ‘danger’ wolves pose to the human population are barking up the wrong tree if you’ll pardon the pun. Research and experience worldwide proves that wolves are no more a danger to humans than any other large wild mammal. Wolf fatalities worldwide in the last century are few and far between. In North America, including Canada, there were no recorded deaths after 1900 until the early part of this century. Two deaths occurred in Alberta province in Canada since 2000. One is probable the other one is certain. One was possibly down to wolves that had been habituated to humans through irresponsible feeding. Despite these incidences you are far far more likely to be killed in North America by a moose, elk, bison, or indeed a domestic dog. The same would apply here, you would be infinitely more likely to be injured by your own or a neighbour’s dog or in the ‘wild’ by something like a large red deer, than you would by a wolf. As long as wolves aren’t fed by humans (an incredibly stupid and irresponsible practice, resulting in habituation) then they want absolutely nothing to do with us. There have been deaths recorded on the Indian subcontinent but these were down to rabid wolves, a problem we would not have here. In short a re-introduction here would pose no threat to the human population. Wolves are not the demonic killing machines they are depicted to be by some people. They are highly evolved social animals and, similar to humans in the sense that family bonds are so strong, possibly the strongest of all animals, including chimpanzees and gorillas. Family bonds and interactions govern almost everything wolves do. While the advantages of re-introduction are clear the difficulties associated with such an undertaking on our part, and perhaps more importantly for the wolves, are less clearly understood and rarely discussed. Wolf populations are recovering in Europe, and wolves now exist in most European countries, Ireland is a different proposition, as is the Britain. Most of the recovery in Europe has been the result of re-population of areas from extant neighbouring populations, rather than the physical re-introduction of animals. Wolves from Italy (which never fully died out) have re-populated parts of France and Switzerland. Wolves from Eastern Europe moved westward and now occupy parts of Germany. In the US some argue that even without a formal re-introduction programme in Yellowstone and Central Idaho wolves were already moving through Alberta in Canada into Montana and Idaho and would have continued the natural expansion of their range. Wolves have also repopulated Oregon, Wisconsin, and Washington State naturally, without re-introduction. Some reports suggest Ireland, Great Britain, Holland and Denmark are now the only European countries without a wild wolf population, although a dead wolf may have been discovered recently in Holland. Ireland and Britain would require a physical re-introduction of the species, and this presents many more difficulties. Firstly we need to consider where we would re-introduce them. Our largest National Park, Glenveagh National Park in Donegal is 170 square kilometres in size. To put this into context, Yellowstone National Park is nearly 9,000 square kilometres in size, and Cairngorms National Park in Scotland is over 4,500 square kilometres in size. While a wolf pack can live in a relatively small area given abundant prey, our parks are small and are not buffered by wilderness areas. Using Yellowstone or Cairgorms again as an example they are buffered by wilderness areas outside the park, in particular Yellowstone which is buffered by the Greater Yellowstone ecosystem with many large areas of wild country. Prey abundance may not be an issue, at least initially, as wolves will eat almost anything, rabbits, hares, deer, carrion, wild goats and sheep (which may exist in Glenveagh) in some cases fish and even mice and rats. Where difficulties may begin to arise is when the wolf population grows, and grow it will. Pack size would increase significantly each year, assuming prey abundance and successful breeding. Wolf packs would inevitably drive some individuals out and some may leave of their own accord. These bigger packs would require more food and need to range further. The individual animals who have left the pack will wander in search of a mate and a territory. This will lead them outside the park and into contact with humans either directly or indirectly through interactions with farm animals. While wolves now exist in Europe in areas where the average human population is 37.5 people per sq KM (Donegal has a population density of 33 people per sq KM), Irish wolves would be wandering into areas where people have no experience of dealing with large predators, and have been led to believe, through myth and fairytale, that wolves are savage killing machines. Wolves kill when they need to feed themselves or their young, and despite what some might have us believe, they do not kill for fun or kill more than what they need. So while they won’t devastate or severely impact anyone’s livestock, they will come into contact with them and occasionally take cattle and sheep. Even with extensive control of the wolf population (as discussed below), some livestock losses will occur. Our landscape, outside national parks, is heavily farmed, making farm animal encounters and losses almost inevitable. Acceptance of this loss would take a massive change in attitudes by people in the area and would also need the introduction of a program to compensate farmers for their losses. While we have other nature reserves and protected areas outside our natural parks these are detached from each other and, again, are small. Wildlife corridors, which might allow wolves to pass between reserves and parks, simply do not exist here. Our only experience of reintroductions are those of the golden eagle in Donegal, white-tailed eagle (WTE) in Kerry and Red Kite to Wicklow. While all of these programmes have successfully led to the first breeding of these birds in the wild in Ireland for a long time, they have not been without difficulties. The reintroduction of the WTE in Killarney in particular met with a lot of resistance. Some representatives of the farming community protested at the airport as the first chicks arrived from Norway. They protested that the eagles would decimate their sheep herds with one prominent member even raising the issue of the safety of small children when the eagles were re-introduced. There have also been many poisoning and shooting incidences involving all 3 re-introduced species. No prosecutions for any of these wildlife crimes have been taken and like many other countries, Ireland’s record of dealing with wildlife crime is poor. This does not bode well for re-introduced wolves here. While education and communication will convince a lot of people it wont convince them all, and wolves would be a much harder sell given their unjustified reputation, the likelihood they would take some livestock, and the fact they are on terra firma rather than flying above our heads like the eagles. The difficulties discussed above are significant, as would be the financial commitment. Research would need to be preformed, studies carried out, wolves transported, legislation enacted or reviewed, wolf populations sourced and compensated for, wolf management strategies developed and enacted, and those management strategies continued throughout the program. The ongoing wolf management would require telemetry equipment, wolf collars, periodic flights over the park, education programs, ongoing public consultation and full time personnel to carry it out. Compensation programmes for farmers, as discussed above, could also prove costly. Never mind “could we” — how about “should we”? The difficulties discussed thus far are ecological, physical and financial ones, but what about the moral and ethical ones? The most important aspect in all this discussion needs to be the welfare of the wolves themselves. Wolves for re-introduction here in Ireland would be sourced from multiple populations to give an initial genetic diversity. More wolves would possibly need to be added later to maintain this genetic diversity and prevent inbreeding, although wolves often disperse to avoid this. Even if the source country or countries agree to this, given our failure to stem poisoning and shooting of our re-introduced raptors, it could apply significant pressure on source populations. The physical collection of wolves would pose difficulties and is likely to result in some losses. They would be collected by trapping, snaring or incapacitation by dart from a helicopter. All of these methods pose risks. During the collection of animals for the Yellowstone re-introduction programme at least 10 wolves died early in the process through trapping and snaring and at least one died during incapacitation from helicopter. One might argue that techniques have evolved and improved since then, but some losses would almost certainly occur. Removal of alpha (lead) animals from a pack would cause huge upheaval, and studies show that it would almost certainly lead to the break up of the pack. Packs that may have been in existence for generations could literally be wiped out by the removal of perhaps just one animal. Wolves may also attempt to make their way back to their own territories. Relocation of wolves in Alaska’s Denali National Park has led to them returning hundreds of miles to their previous locations. Obviously wolves introduced in Ireland would be unable to do that, but the instinct to return home could lead them to wander into areas where they will subsequently need to be removed from. Wolves re-introduced in Ireland would need to be heavily managed, some might say controlled. It’s likely that their locations would need to be monitored daily, and that at several animals in the pack would be burdened with telemetry collars. Wolves may need to be re-captured if they move into areas deemed undesirable, and pups may have to be relocated if adults den outside the national park they are introduced into. Would such a heavily monitored and managed population really mean we have wild wolves in Ireland again? In my opinion, while the re-introduction of wolves here might have some benefits, both ecologically and psychologically for us, there would be no benefit whatsoever to the wolf, either as a species, or to the individual animals released here. The number reintroduced would, by necessity, be small, extensively managed, and their population artificially controlled. Given the difficulties discussed above in relation to space, and interactions with humans, any such reintroduction would stand a reasonable probability of failing, resulting in the destruction of all of the wolves concerned. It would also have a significant negative impact on source populations. Re-introduction in Ireland would not result in any increase in the the worldwide wolf population, and would simply be an exercise to satisfy our own selfish needs. For re-introduction to even be considered in Ireland we would need a massive change in perception, understanding and attitude towards wolves and predators in general. We would need far more extensive wilderness areas, and a well established network of wildlife corridors to connect them. Wolves haven’t roamed free in Ireland for at least 200 years, and personally I don’t think they will be doing so again any time soon. These are my own views on wolf re-introduction in Ireland, and I welcome debate about the subject via comments here or at intothewild@live.ie. FOR decades, whenever wolves preyed on livestock, the routine response among many ranchers and wildlife managers across the West has been brutally simple: kill the wolves. More dead wolves equal fewer dead cows and sheep, the reasoning went. And in many cases the reasoning is likely dead wrong, according to research published recently by a leading Washington state wolf scientist. Confounding widely held beliefs, the new study indicates lethal responses to livestock predation by wolves often lead to an increase in attacks, or depredations. It’s a message that may not be heard in Washington, where state wildlife managers responded to livestock depredations by eradicating the Wedge pack in 2012 and killing the alpha female of the Huckleberry pack last summer. Recently, the state Department of Fish and Wildlife announced it will swiftly move to lethal tactics if the Huckleberry pack kills any livestock next spring and, in statements to conservation groups, has said it is considering “pre-emptive” killing of wolves. Both of these policies flout the state wolf plan, which emphasizes conflict-deterrence as opposed to simply killing wolves. Killing of wolves by the state compounds illegal wolf-killing by those few who take things into their own hands. Reports last month that the alpha female of the trouble-free Teanaway pack was fatally shot come on the heels of a Whitman County farmer chasing a wolf for miles before killing it, and Stevens County commissioners exhorting county residents to kill wolves. Earlier this year, a wolf from the Smackout pack was found illegally killed in Stevens County and another wolf was discovered gunned down in Ferry County. The groundbreaking research by Washington State University wolf scientist Rob Wielgus, published in the Dec. 3 issue of the scientific journal PLOS One, suggests killing wolves can have unexpected results, dissolving previously well-behaved packs and leaving small groups or lone wolves more inclined to kill livestock. Wielgus said many states are aggressively managing wolves based on the largely untested perception that lethal control reduces depredations. His findings reflect research by other scientists showing increased black bear and cougar mortality results in more depredations. Examining annual reports from U.S. 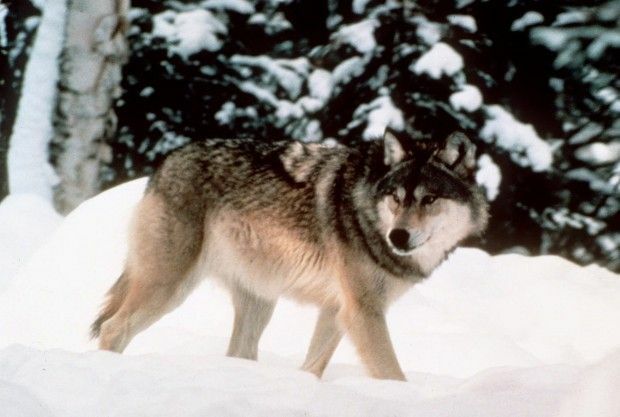 Fish and Wildlife Service and the U.S. Department of Agriculture over 25 years, Wielgus’ analysis found that each wolf killed increased the chance of livestock depredation the following year by 5 percent. Not until the mortality rate of wolves exceeds 25 percent would livestock depredations decrease. His study opens the door to further study and debate about whether we’re doing enough to recover wolves. A recent study I co-authored analyzing the additional good wolf habitat across the United States found that more than 25,000 square miles of suitable habitat remains unoccupied in Washington — more than five times the area currently occupied. In all, the study identified more than 350,000 square miles of additional habitat for gray wolves in 19 states, offering the potential to nearly double the wolf population in the Lower 48 states to around 10,000 by expanding recovery into suitable areas of the West Coast, Northeast, southern Rocky Mountains and the Grand Canyon area where the first gray wolf in the region in more than 70 years was just confirmed. But, as we consider expanding wolf recovery to levels that leading scientists deem more sustainable, we must first expand our approach to wolf management. And, as our knowledge of how human activities impact wildlife continues to evolve, Washington’s wolf-management policies must evolve toward serving not just hunters and ranchers opposed to wolves but the interests of a broader range of taxpaying constituents, who demand that wildlife be managed not as a problem but as a treasured public trust. Amaroq Weiss is a biologist for the Center for Biological Diversity where her work focuses on recovering wolves across the Northwest, Rockies and California. Why Killing Wolves Might Not Save Livestock New study fuels debate over how to reduce attacks on cows and sheep.